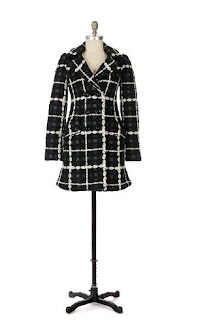 So remember when I succumbed to temptation in NYC by buying a black-and-white plaid coat? And then I blamed my weak resolve on how fabulous WendyB looked in her coat? (See here and here to refresh your memory.) Well, I was searching for something in my archives and came across one of my Anthropologie birthday wishlists from September. The coat was listed as one of my items! While Wendy may have reawakened my desire for it, I think in the end I can chalk this up to my own hopelessness. Yeesh. haha that's really funny! :) but that really was a great buy. hahaha sometimes you want so many things you forget! regardless - it's a great purchase! Funny! It was a good purchase either way, so don't be guilty. Haha I think I'm more bemused at my own hopelessness than guilty. There's a wind warning for the Metro Vancouver area today and I'm wearing the coat...I feel so cozy!